In what ways did economic considerations affect the decision by Britain and France to make their Black African colonies independent? Why were early expectations that independence would lead to rapid and sustained economic development in Africa for the most part disappointed? This title, originally published in 1986, seeks to tackle these two important and strongly debated issues. The main aim and value of the book is to take a broad view of this huge subject, pulling together material on most parts of Black Africa south of the Sahara and north of the Limpopo so that the problem can be seen as a whole. It takes account of a wide range of possible and actual factors which have influenced African economic development, weaving them into a single analysis, including the colonial inheritance, the impact of the fluctuating international economy, policies adopted by African governments and indigenous factors such as climate, drought and human resources. The book is written to be understood without difficulty by non-specialists and is intended to act as an introduction to its subject for university students. Part I: The End of the Colonial Period 1. 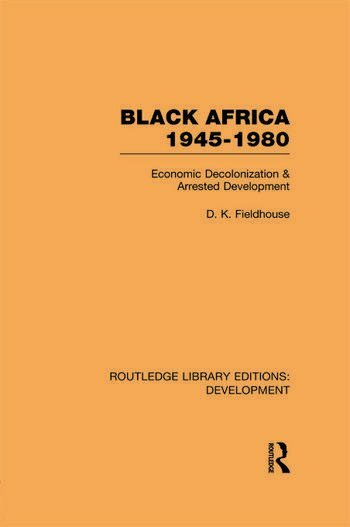 The Economic Dimensions of British and French Decolonisation in Black Africa 2. The Colonial Inheritance Part II: Economic Performance and Explanations, 1960-1980 3. Performance, Expectations and the ‘Policy’ Approach 4. ‘Non-Policy’ Explanations of Limited Development Part III: The ‘Policy’ Explanation in Six African States 5. Anglophone West Africa: Ghana and Nigeria 6. Anglophone East Africa: Kenya and Tanzania 7. Francophone West Africa: Ivory Coast 8. Francophone West Africa: Senegal 9. Summary and Conclusions: Economic Decolonisation and ‘Arrested Development’.